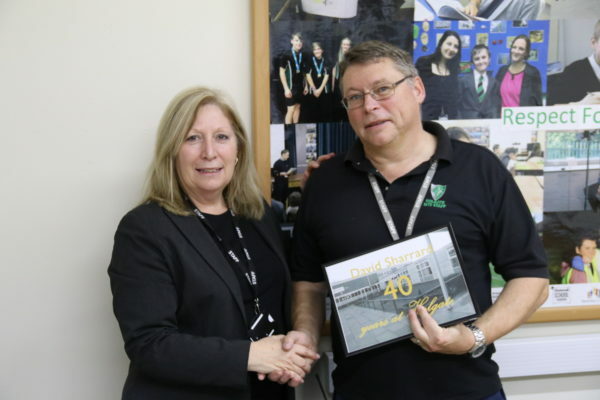 The Holgate Academy employee, Dave Sharrard, reached a milestone in his career this month as he celebrated 40 years’ service at the academy. Dave, who is the academy’s site manager, started working at Holgate back in November 1978 as an assistant caretaker – one of his first jobs after leaving school. Over forty years, he has climbed the ranks to become the team leader, and is now responsible for 24 staff, academy health and safety issues and for the running and maintenance of Holgate’s split sites across Nabbs and Hillcrest. Throughout his forty years in service, Dave has seen many changes at Holgate but remarks that one thing hasn’t changed: Holgate being “a great place to work with a strong team spirit!”. Congratulations to Dave and here’s wishing him many more successful years of service.